In this section of our website we are going to showcase and introduce you to a range of games which you can play on any Android device that can and regularly do award their respective progressive jackpots. The following games are available at all of our featured Android Casino sites, and there are different ways that each of these games will award their jackpots, so if any of them take your eye and you wish to give them some play time, make sure that you take note of the ways in which you have to play the slots to have any chance of winnings the jackpots.! 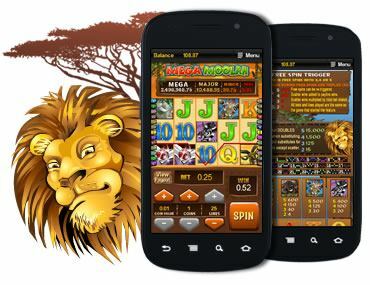 These games are part of the Microgaming progressive game network, and as such they are available not only to Android users playing at a mobile casino site, but you will also find them on offer at any online casino sites powered by Microgaming. Being a range of networked slots that does of course mean you are going to have exactly the same chance of striking gold and winning the progressive jackpots when playing any of the following games online or on your Android device! Plus the jackpot values do rise very quickly due to the massive number of players playing them both online and on their mobile devices. Mega Moolah – We have chosen to place the Mega Moolah progressives slot game overview at the top of this listing, for as soon as you discover all of its unique features you will probably not wish to play any other slot game other than this one! The Mega Moolah slot is quiet different form the vast majority of progressive slot games in as much as you can play it for various stake amounts, you can opt to put into play up to 25 paylines per spin and you can also increase the number of coins you play on each activated payline. But, and this is a major but, you will always have the chance of winning one of four progressive jackpot irrespective of the stakes, number of coins or the number of paylines you choose to play it for! There is a special Mega Moolah bonus feature round which is triggered randomly, and when awarded a player will then have to spin a special wheel type animation which is split up into several different segments, as soon as the wheel is spun and then stops the colour of the segment facing the win arrow will determine just which one of the four progressive jackpots you will win! This Mega Moolah slot also comes with a regularly triggering free spins bonus feature round and when triggered via three or more scatter symbols spinning in you get to play off 15 free spins on x3 multipliers. Treasure Nile – The Treasure Nile slot game was one of the first 9 payline slots to ever appear online on which a progressive jackpot could be won. Now one very important aspect of playing this slot game which you need to be aware of is that the progressive jackpot paying combination of reel symbols is only awarded when they line up on the ninth payline. So when playing this Treasure Nile slot on your Android device or in fact on any gaming platform you must activate all nine paylines to get a chance of winning the progressive jackpot, playing anything less than nine paylines will mean you can never win the jackpot! This coin is also a fixed coin slot, which means the coin values cannot be adjusted, and as such the coin values are locked at 0.50 and with only one coin per line being able to be put into play does mean you have to play it for stakes of 4.50 per spin to have a chance of winning the progressive jackpot! Cash Splash – The Cash Splash slot game is another progressive slot which comes with fixed coin values. But this slot is a single payline slot and you can choose to play up to three coins per spin. The coin values are set at 1.00 and by playing three coins per spin the progressive jackpot will become activated on the pay table. As soon as you play maximum bet spins and then manage to get all three of the Cash Splash logo symbols appearing on the payline you will win the progressive jackpot. This is a popular slot game so its jackpot is won very regularly, and in fact it is not uncommon for it to be won twice in one day! Major Millions – The Major Millions slot game is quite similar to the Cash Splash game listed above, however when you play this 3 reel slot you will be able to play three pay lines on each spin. This is another fixed coin slot and the coin values are fixed at 1.00. You can only play one coin per payline and with three of them on offer then a maximum bet spin will cost you 3.00. You do need to play three coins, three line spins for the progressive jackpot paying combination which is won by lining up three or the Major Millions logo symbols is only payable when they line up on payline number three! One final aspect of playing any of the above slot games which is going to make them even more playable is that unlike progressive games from other software and game providers, if you every do win a progressive jackpot at a Microgaming software powered mobile or online casino, the casino at which you win that jackpot is going to pay you the entire jackpot in one withdrawal. Many online and also mobile casinos have monthly cash out limits in place, which often means progressive jackpot winners have to wait weeks, months and occasionally years to get paid their entire jackpot win! But that will never happen if you play and win at any of our featured Android Casino sites, as your winnings will be processed and sent to you quickly and in one payment.